The dataset of citations I’m looking at starts in 1976. And I can break down not just which journals are cited, but which years of those journals are cited. (And which years they are cited in, but I’m setting aside that data for now.) So as well as asking which journal is the most cited – it’s The Journal of Philosophy by a reasonable amount – we can ask which journals papers in year X ended up being the most cited. And from 1976 through to the early 1990s, it is The Journal of Philosophy by a lot. Fourteen of the 25 most cited journal-years are from the 1976-1991 run of The Journal of Philosophy. 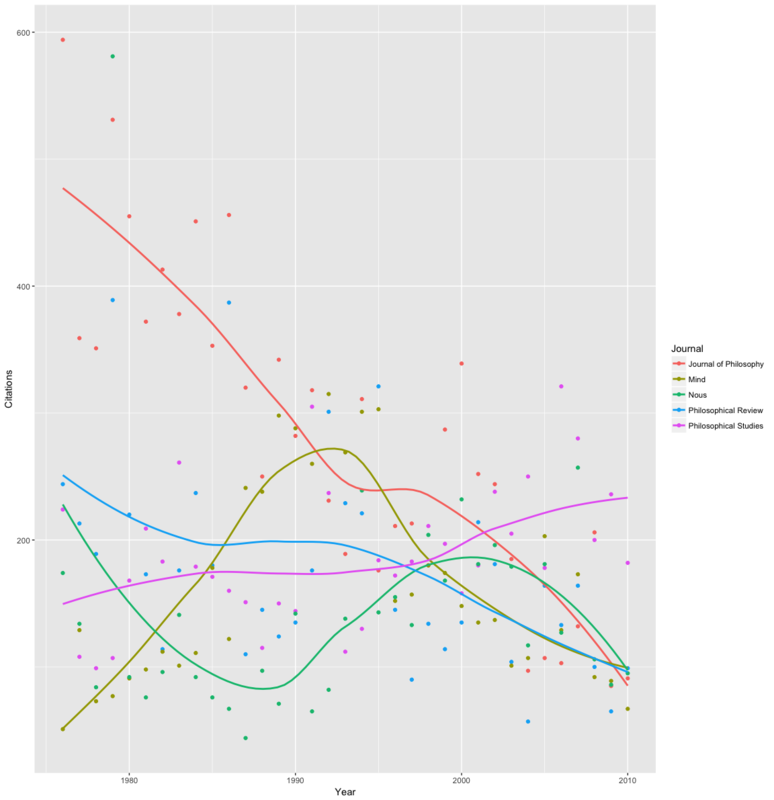 But from around 2002 onwards, the most cited journal is Philosophical Studies. Here are a couple of graphs that show the change. First, I’ve graphed the number of citations each journal has in the other 31 journals in the data set. Each dot represents a single journal-year. So the top right at the top left represents that the single most cited journal-year in the data set is The Journal of Philosophy‘s 1976 volume. It featured really influential pieces by Alvin Goldman and Michael Stocker, and those articles alone would have been enough to make it a standout year. The lines are loess curves through the data points; the dots are the actual measurements. The lines mostly slope down towards the end, because articles published in recent years have fewer chances to build up a citation count. 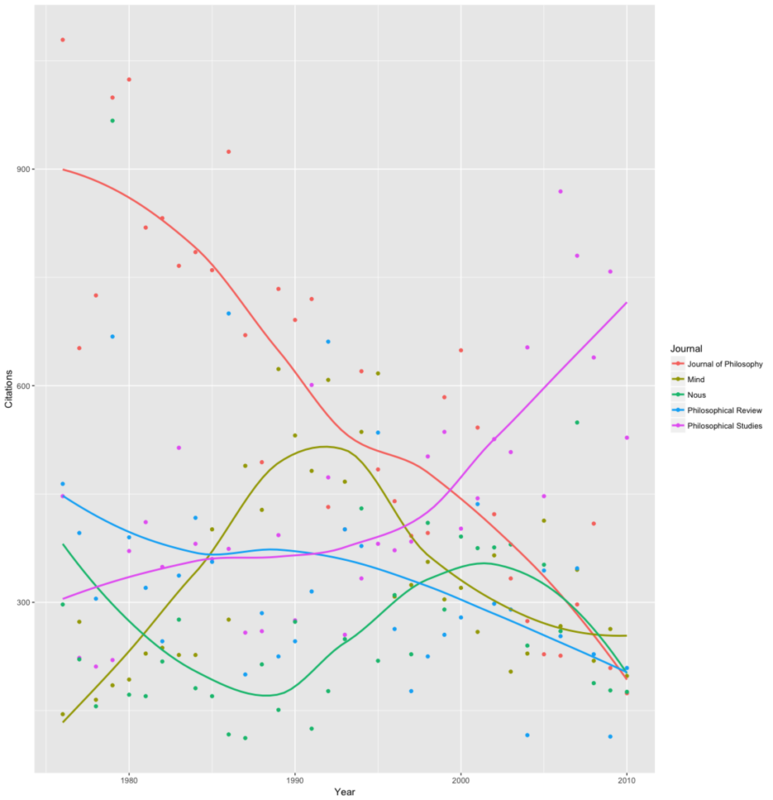 Note that almost all the dots towards the top of the graph are red, they are for The Journal of Philosophy. There is a dot for Nous 1979 (which included famous articles by Perry, Lewis and Cartwright), but otherwise the high points on the left are all red dots. But as we go into the 2000s, the purple line moves ahead, and the purple dots become more visible at the top edge of the graph. I stopped the graph in 2010, because after that the number of citations starts to get very small. There just hasn’t been enough time for some of those articles to be cited. But the same pattern holds; indeed, Philosophical Studies takes a more pronounced lead. The pattern is the same if we look not just at citations in the other 31 philosophy journals I focussed on, but at all journals in the Web of Science Arts & Humanities Index. Now part of this is that Philosophical Studies publishes so many articles that it can do very well on graphs of raw citation count. But this isn’t the whole story. After all, Philosophical Studies has published a lot of articles per year for a long time, but the jump in citations is relatively recent. There is one other striking thing about this recent surge in citations to Philosophical Studies: it largely happens without any individual articles getting huge numbers of citations. Some years there are articles in Philosophical Studies with huge citations. In 2006 the articles by Knobe and by Street are a big reason why Philosophical Studies does so well. But not all years are like that. A big part of the story is that Philosophical Studies went from having its not-so-huge articles get 5 citations a piece, to getting 10 citations a piece, and that adds up. The underlying story is that citations are getting much more egalitarian, both across and within journals. And it is striking just how big a role The Journal of Philosophy played in the philosophy world up to 1990, and how big a role Philosophical Studies plays nowadays.